Does Verizon Rule the air? Is T-mobile America's Largest 4G Network? Does Sprint really provide unlimited value? Consumers can benefit from information of a more quantitative nature than carrier advertising slogans. On that theory, the California Public Utilities Commission (CPUC) has sent testers to travel the state. At 1200 locations from San Diego to Crescent City, coverage and performance reports have been collected. Preliminary results from the first drive study have been released. The CPUC also filed an Initial Staff Report with the Federal Communications Commission (FCC). The testers sent and received data to and from computers at Internet hubs on the East and West coasts. For each of the four carriers surveyed, tests were done with an Android phone and using a netbook equipped with a cellular data modem and a GPS locator. 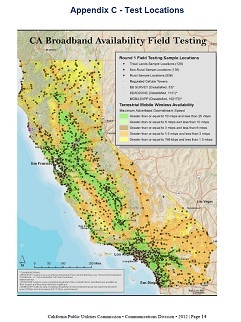 The CPUC's data presentation is useful to get an overview of cellular service in the state. It is not easy to drill to a small area to find the quality of services in a county or city. Fortunately, they have published the individual observations in spreadsheet format along with a description of their program. We have extracted their data and present it as Google maps overlays below. You might want to compare new data with older data in a region to see if a carrier has been improving the network. You would open map views of that carrier at different times in separate windows. Here we have picked on Salinas and Verizon. Or you might choose to compare carriers to see which has the best service in your city. In the example above, the legend has been cropped out of the pictures. You may find that the legend does not display at all when using the Firefox browser. Google Chrome seems to work best. In Maps you can inspect the data values that select the color by clicking on an icon. A bubble will show the location index and two measurements of the download speed from the West coast server. The highest of the two measurements is used to select the icon's color. The location index will be the same for all four carriers. You can use the index to find a data point in the CPUC excel spreadsheet if you want to examine the measurements not included on the map. When we generated the kml map files, we found non-numeric values in the spread sheet for some locations. The values were words like timeout and no_connection. We assigned these tests a speed of 0. If both tests to West coast servers were zero, the icon is colored black. While the purple or egg plant color is suggested in the legend as perhaps a 2G or 2nd generation cellular connection, it is just as likely that it is a marginal signal from a distant tower running at a higher cellular standard. Measurements behind the green squares meet the FCC's current download definition for full broadband service at greater than 4 Mbits/sec. Measurements behind the red squares meet the California download definition for served broadband at 6 Mbits/sec or greater. Lower speeds are under-served. If there is no usable signal they are unserved. It is comforting to see that in some speed tests, Verizon results were above 40 Mbit/sec -- fully six times faster than the California broadband definition. This means that the equipment used for the tests is not coloring the results. Tests were done throughout the day at times that were not controlled for network loading by other traffic. Tests done early in the day might face less cross traffic congestion than tests later in the day. Some maps are missing icon symbols at locations that have them on other maps. We assume that this means no test was performed at that location. It is not an indication of poor coverage. It is an indication only that some data that could have been collected was missed. Example: there is no icon under the n in Salinas in the Fall 2012 map above. California also has a threshold standard for upload speed. Handsets need to push data into the network at higher than 1.5 Mbits/sec as an additional requirement for served status. The CPUC did upload tests on their drive surveys, but they are not reflected in these map overlays. The FCC has its own program called Measuring Broadband America. The mobile component of this program will be based on data from subscribers who volunteer to host a testing application on their Android phone or tablet. The program is slated to kick off in March 2013. If you have examined the CPUC data sets on the maps and concluded testing with greater spacial granularity would be a good thing, this program may provide it. As indicated above, the data here was collected under the direction of the California Public Utilities Commission. Michael Morris from the CPUC's Communications Division is the lead. To the extent that any opinions or interpretations have been included in this write-up, they are solely those of the author -- Jim Warner. Warner is a network engineer at the University of California Santa Cruz. Many people have contributed to the survey project and should be cited for their hard works. The mobile testing applications were assembled by Professor YoungJoon Byun at Cal State Monterey Bay.